5%offOPENINGcelebration – your coupon expires on 28 March – use it now! please click on the link above to if there’s anything that you might like! Your coupon – 5%offOPENINGcelebration – can be redeemed at the shopping cart. I have just spent a couple of hours putting the 9 designs of these machine embroidered iron-on labels into one listing here on etsy and I thought I might as well put them up here so that you know they are available! They are also listed on my new retail website here on JULZ CRAFT STORE . You can use them for dressmaking, knitted garments and any other handmade item – if adding a name or writing to them, please remember to use a permanent marker pen, as ordinary pens will smudge in the wash. If you don’t want to iron them on your carefully made item, you can sew them on – or even tack them onto a wooden object! There are four labels in each pack – which sells for £3.99 – and available to buyers in the UK and Worldwide. 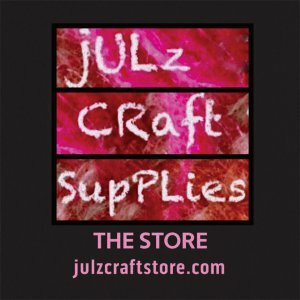 If you are buying them from JULZ CRAFT STORE – do remember to use the coupon code – which is on the right hand information area on this blog, so that you get your 5% discount. Yes I know its not much, but if you are on my mailing list, I have sent you a coupon for 10% off, and once you have put in a order to my new website, you will get a coupon code for 10% off your next order! Technically the shawl as a garment and as a word comes from 14th century Persia. They were woven rectangles worn over the shoulders and made from kashmiri goat. That’s significant I think because Kashmir was a major trade center. Knowledge and supplies and all sorts of other goodies coming out of India had to go through Kashmir to get to the western world. In fact I personally believe its very likely that the shawl as a garment originated in China, was adopted by India, and from there passed to the weavers in Kashmir (but I can’t find any sources to back that up). From Kashmir, shawls spread to southern Europe and North Africa. Ethiopians took to wearing large rectangular shawls that can be wrapped around the body once and then over a shoulder. Manila shawls took Spain by storm in the 15th century. These were square pieces of woven silk with hand embroidered designs. They seem to have picked them up from the Philippine islands (again I’m saying the shawl is a Far East garment) and once the Spaniards had them, they went to the New World. All these early shawls were woven. 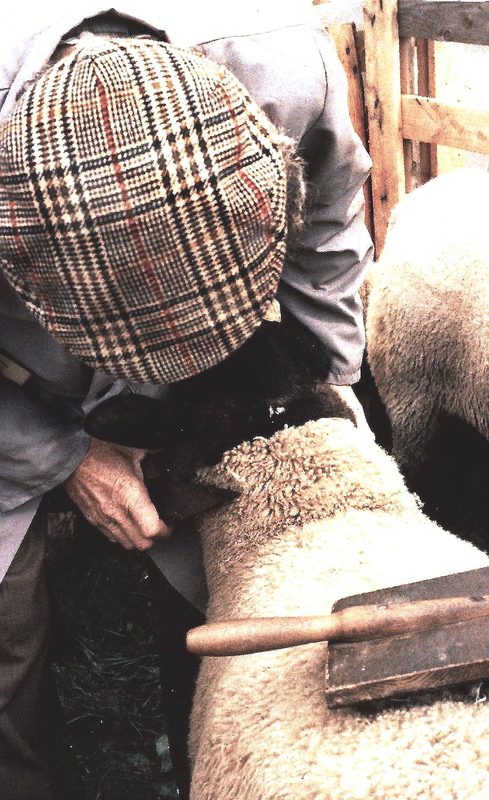 They were made in whatever fiber was on hand; silk in the east, cashmere in the near east, wool in the New World. 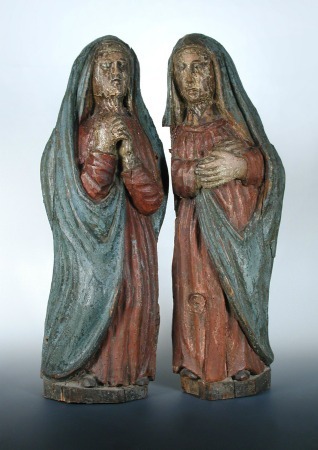 They were square or rectangular in shape and usually large enough to wrap and fold around the body. 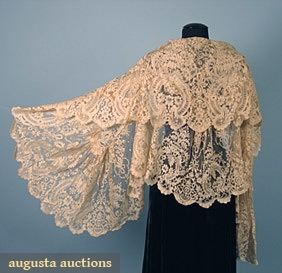 Decorative lace shawls seem to have come into fashion in the early 1800’s. The earliest styles were made on tambour or other netting with intricate designed stitched/embroidered on that base fabric. This seems to be when shawls became circular and triangular. Hand embroidered Spanish blonde lace on ecru silk net, circa 1830’s. 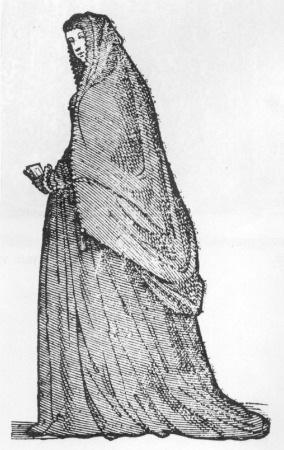 A French fashion plate displaying a shawl of black Chantilly lace, circa 1865. 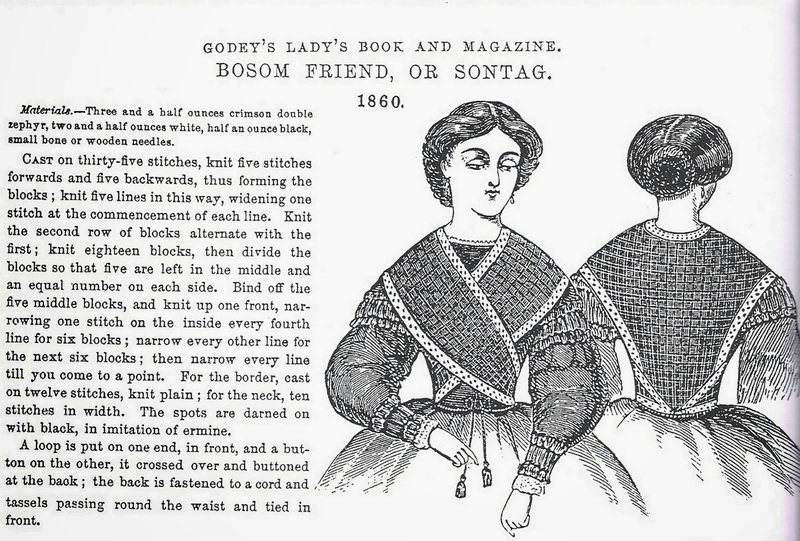 The “bosom friend”, aka sontag from Godey’s Lady’s Book and Magazine, 1860. Up through the 1920’s shawls and stoles and wraps were worn by ladies in English speaking countries of all economic levels. Wealthy women wore creations of handmade lace and silken embroidery. Working women wore cheaper, machine made imitations. But all women had a shawl or two to dress up and cover up. Not so today. Today its a rarely seen specialty item. For those of us who do wear shawls there is a dizzying array of styles and shapes and choices. And isn’t that just wonderful? We get to borrow on all these traditions of shawl making and invent some of our own. Shawl patterns can be found big or small, in every shape, in lace, cables, and color work. You could spend a lifetime making shawls and not explore everything. Isn’t it nice to arrive into 2018! Well I think so anyway. Last year was extremely disruptive, what with the landslip, and being evacuated from my house, and having to virtually camp in my new home, as the building work still hasn’t been done. But things are getting better, and I am slowly sorting things out, and have great plans for this year – smile – which I feel strangely confident about. So here’s to 2018, and hoping it goes well for all of us. 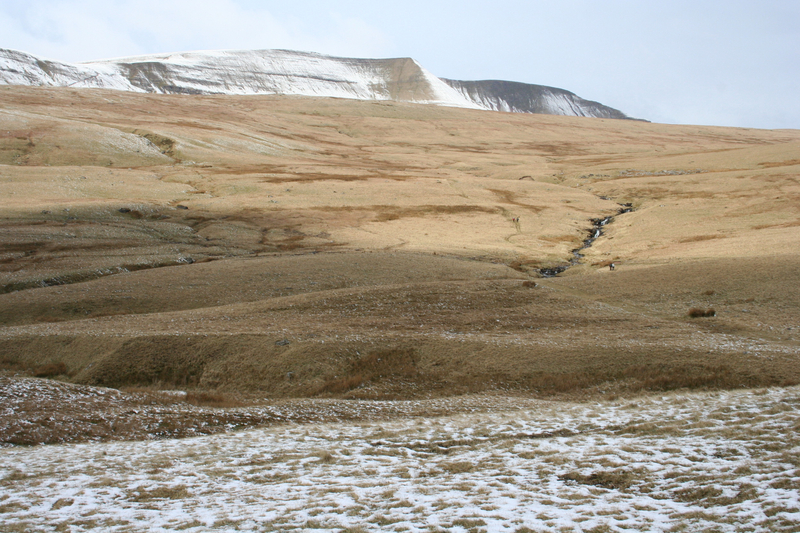 my “twelve days of christmas” sale ends at midnight (uk time) on 3 january – thats tomorrow! Tomorrow, I will get back to the series on the Twelve Days of Christmas Carol – next up is 6 Geese a-laying. As I explained in my last post, its actually 10 days and goes on until 3 January. All my listings have been reduced by 10% for this period, and there is no need to add any secret code to get the discount – you will see the usual price and the sale price on the listing – so just buy anything you want NOW! If you want to just browse, do ‘favourite’ any items you are interested in, so you can find them easily when you have made your decision. Below is a small selection of the listings – there are over 100 of them – so you might well find something you didn’t know I sold! click here for my Etsy Shop. I am aware that many of you are not registered with Etsy, but you can have a look without registering, and can buy as a visitor if you don’t want to give them all your information! The sale does not apply to any listings I have on ebay, and in any case, I think all of them have just expired, and will be renewed after 3 January, or not at all! Apologies to anyone looking for the Mawata Silk Hankies, they have been the most popular item ever since I got back to selling – I have run out of stock – and couldn’t find anymore on my suppliers list either. I hope to re-stock as soon as possible. I’m just listening to Radio 4 as I write this and it turns out that I am not the only person doing a little series on the TWELVE DAYS OF CHRISTMAS CAROL! They are doing the 12 tweets of Christmas – also on birds! If you want to listen to them, I’m sure they will be on the Radio iPlayer page of the BBC website. I will, I hope, finally get round to writing the next episode of the series tomorrow – on the Three French Hens! If you want to see The Partridge in a Pear Tree post, click here!